Up Woods Creek. Down Mary's Peak road to Harlan road. I did this ride last summer so I knew what I was in for. Then I was meeting Linda on the coast who already had a campsite, so I was not carrying the camping gear. This year I was self supported so the load was a bit heavier. There is some steep stuff on this climb. Last year I had to get off and push a few times. This time I was able to stay in the saddle even when I was only going about 2 mph. Nice that this bike is even stable at that speed. Every mountain has a top, and every downhill on bike makes you quickly forget the pain you just endured on the other side. 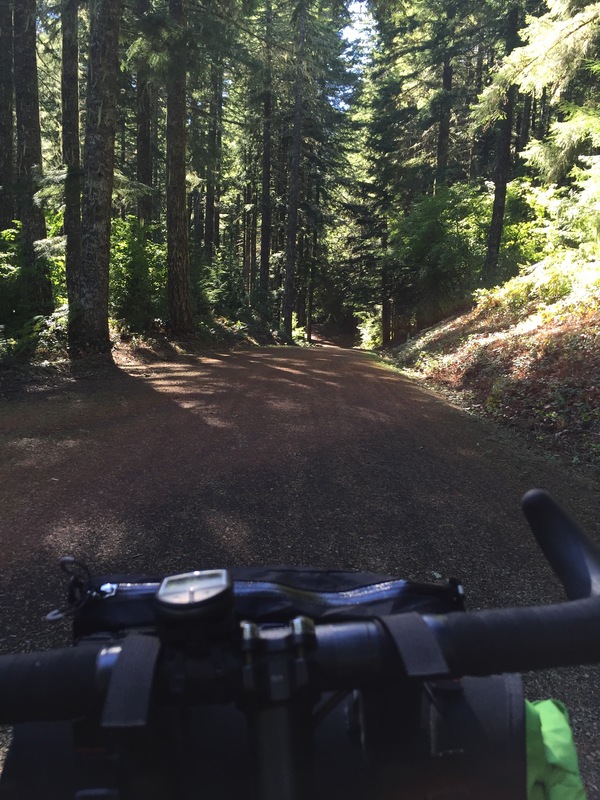 Mary's Peak road from Connors camp trailhead to Harlan road is 10 miles of fast downhill. The first mile or so is a bit rough as it was graded with course gravel for some logging a few years back. The gravel is all worn in now so it is just a bit bumpy. 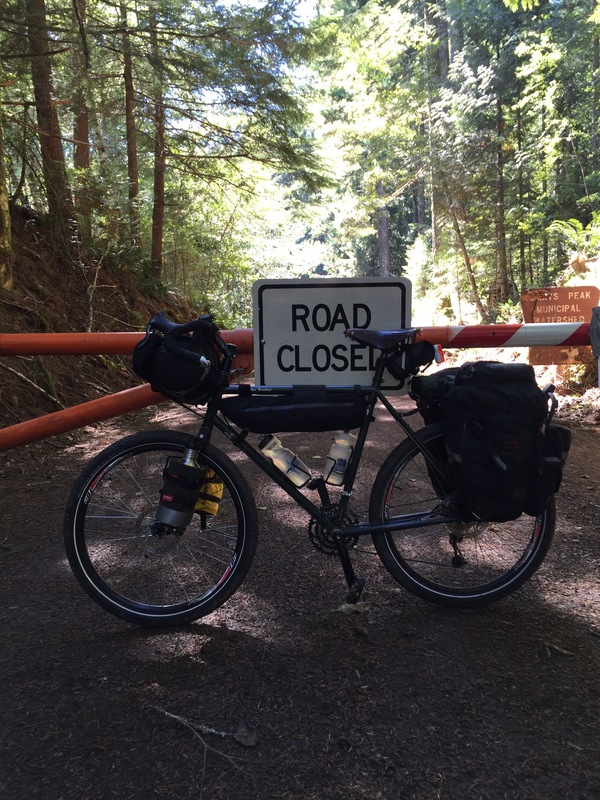 After the logging road cuts off it is much smoother and a very fun descent. The woods are lush and the air was cool. No question that it made the climb worth it. Of course every great downhill has a bottom and this one ended at Harlan road, about 4 miles east of Harlan. This is a wide well traveled gravel road. There is nothing in Harlan, but shortly after is Big Elk Campground. I had a decision here as to my route. The most direct route to the coast was to take Hilltop road. I had never done it but I had the FS map and it looked fairly straight forward. I decided to save this for another day as I knew it would involve more climbing and I was beat from the Woods Creek climb. 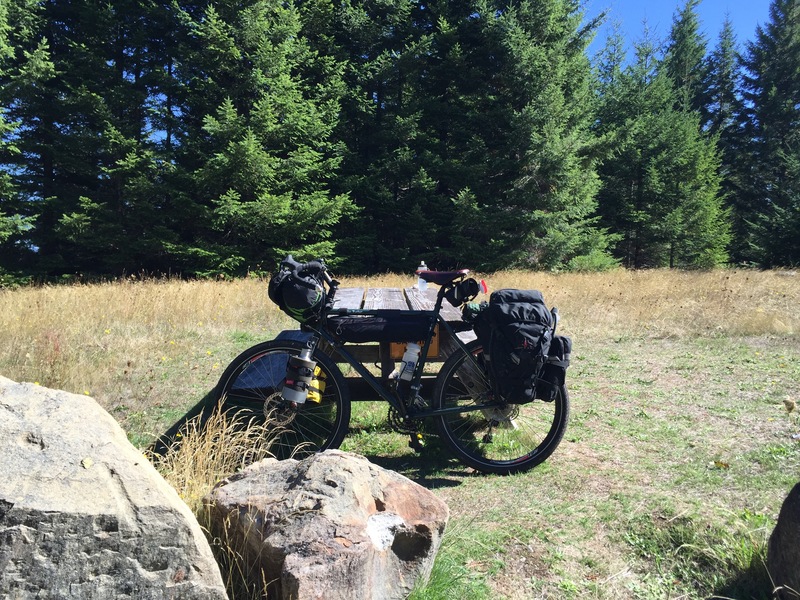 A stopped at Big Elk campground for a snack. I thought about staying the night. It is a nice spot and looks to be free camping. But it was only about 4 PM and I wasn't ready to stop. It is 20 miles from Harlan to Elk City on a nice wide, mostly flat, gravel road. It follows Big Elk creek pretty closely the whole way. 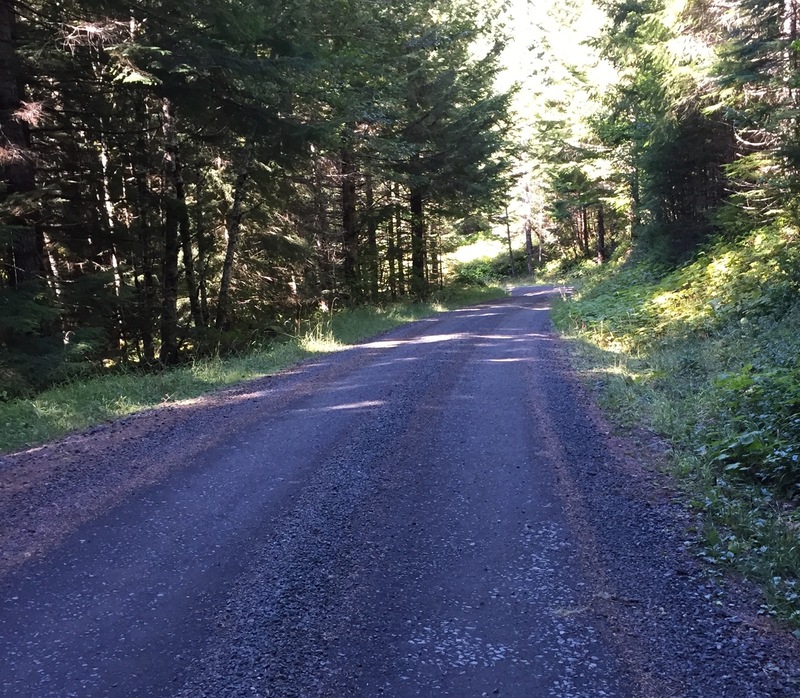 The road was pretty smooth for the first 12 miles or so and then I started running into some washboard, some potholes, and some loose gravel. Not a problem for the 52 mm tires I was riding. I got to Elk City with plenty of light left in the day. 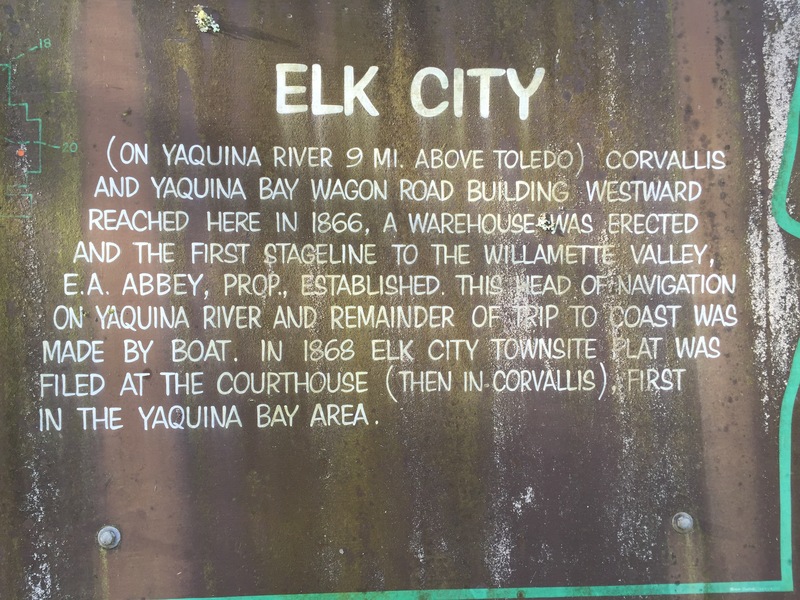 There is a little Lincoln county park / boat ramp / campground there at the confluence of Big Elk creek and the Yaquina River, 23 miles upstream. It is a popular spot with salmon fishers. The fee for camping is $20 so I found the camp host and talked him into letting me camp for $10. 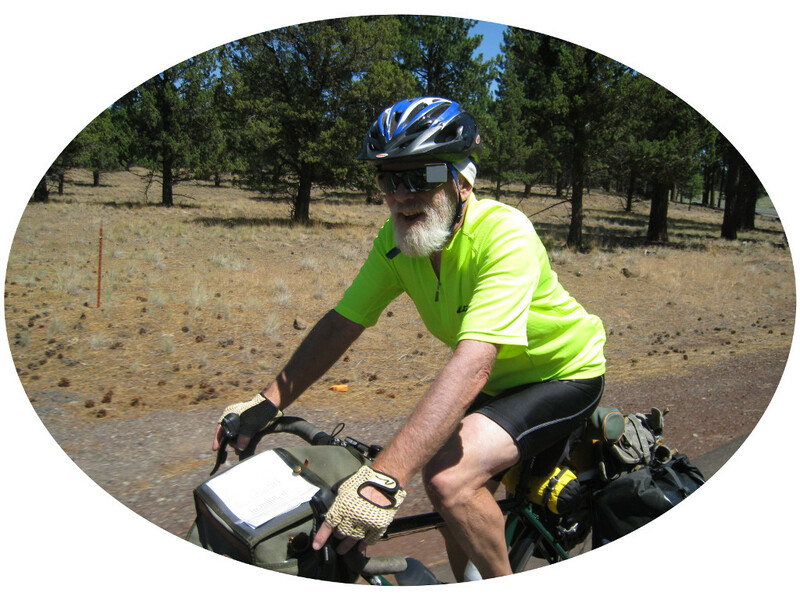 He was so impressed I had rode from Corvallis I think he would have let me stay for free. He even brought me a wheelbarrow full of dry firewood! I found a spot out in the open where I hoped to have a good view of the moon. Tonight was the super moon eclipse and it was clear as a bell. When the moon did come up it was behind a hill so I had to walk out a ways to see it. By then the eclipse was well underway and a crescent was already showing as the shadow was moving away. Still quite spectacular. The downside to camping by a river of course is the dew. It set in early and heavy. Everything was wet before it was even dark. At least I had a fire. Here is where I really regretted bringing a bivvy sack instead of a tent. I was warm and dry in my sleeping bag, but the bivvy and everything else was soaked. Between this and the brightness of the moon I did not sleep well.